Nearly everything you read on this almost five-year-old blog is only indirectly related to my professional responsibilities, but this is a rare post that relates directly to them (currently interim CEO at National Public Radio). A week ago, we announced a joyless decision to discontinue the innovative program, Bryant Park Project, produced in our New York facility across the street from Bryant Park. The paragraphs below are a lightly edited and linked version of an email that I sent this morning to a BPP staff member in response to a suggestion that we turn BPP into a web site. Look for another post on the Bryant Park blog from me that provides additional information (see update below). I've read about a quarter of the comments about the cancellation on the BPP blog and you're of course characterizing them accurately. Obviously, you and the rest of the staff have done a great job building loyalty among your audience and in presenting news in a different way. You have my gratitude for that. I'm not sure how someone who has done articles, speeches and consulting about the importance of disruptive investments (in the Clayton Christensen sense), supported the BPP initiative when I was an NPR board member, and is now trying to shape NPR into more of a digital company finds oneself on this side of a decision to end this great project. It's not an abandonment of young people. Look at npr.org/music or our successful podcasting efforts. Age demos are curves. This is not meant to diminish BPP, but Morning Edition and All Things Considered have more younger podcast listening than does BPP, and way more radio listening, simply because wide radio carriage delivers awareness of both. BPP's great contribution wasn't quantitative, though, it was in helping us learn. We've/I've learned -- or relearned -- a lot in the process. Sustaining a new program of this financial magnitude requires attracting users from each of the platforms we can access. In this case, radio carriage was inadequate and web/podcasting usage was hampered -- here's the relearning part -- by having an appointment program in a medium that doesn't excel in that kind of usage. Web radio is growing very rapidly (much faster than FM did, for example), but it's almost all to music and, increasingly, to attention-tracking music. Perhaps the future of news on the web is in the same user-programmed direction. I'd like to see good minds like those of the BPP staff think about how we can do good journalism delivered via the web using techniques beyond just throwing up another portal-type web site and expecting people to come to it. Our new open API release is a great tool for that. The realities of how people use the web, how web audiences grow through search, and technologies for tracking attention and tailoring content delivery to match how people spend their attention all need to be considered. Portals still have a place, just as their close cousins radio transmitters do, but we can no longer put all our eggs in that basket. NPR will, I hope, be a leader in a new generation of news delivery over multiple platforms, including ones we've never conceived. But we can't make those 2nd generation investments if we continue 1st generation efforts that aren't consistent with what we know about how media usage is maturing. Updated, 3:45 p.m. Eastern: A longer version of this has been posted to the Bryant Park Project blog. 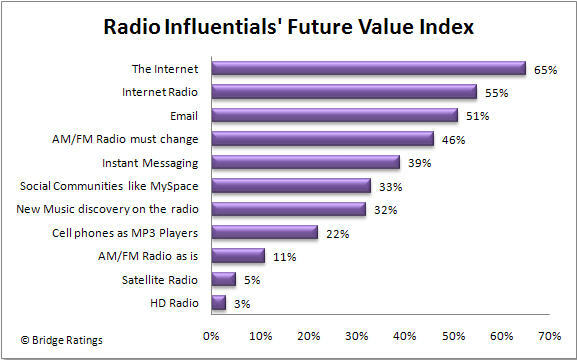 Is Terrestrial Radio Destined to Die? The Federal Communications Commission is expected to decide next week whether satellite radio companies Sirius and X-M can merge. Satellite radio has roughly 20 million listeners, but new technologies are posing a challenge to market shares. ¶ Celeste Headlee reports on the development of portable Internet radio. Then NPR's Alex Cohen gets a primer from Wilson Rothman, an editor at Gizmodo.com on the difference between leading radio technologies and Madeleine Brand talks with Mark Ramsey, president of Mercury Radio Research, about why the emergence of new technologies won't spell the end for terrestrial radio. Hate the name (but then I'm an early boomer), but Slacker the audio service looks really interesting. I've posted about it four other times if you want to catch up (March 15, March 29, April 22 and June 19). Slacker is a competitor with the so-far better known Pandora and last.fm in that it uses a station metaphor, permitting users to customize music to their preferences and those of others like them. Rick Broida did a review of the Slacker beta for PC Magazine back in July to which I failed to link at the time. It's now taking orders for a mid-December delivery of a player that refreshes "station" content via USB or WiFi. Earlier reports had a satellite receiver dock coming that would give it true wide range mobile coverage. There are still references to it on the Slacker site, so even though the dock hasn't been released, I presume it's still on the way. Tom Gideon writes about the new player this month under the title, Slacker Portable Player (Finally) on the Way. Link: PC Magazine. For commentary on this disruptive technology from a radio consultant's perspective, see Mark Ramsey, Slacker's personal radio player finally debuts. Link: Hear 2.0. So on Sirius, the two NPR channels have only a combined 0.2% share of its overall AQH and on XM, the single non-NPR public radio channel has only a 0.1% share! So much for the Death Star. There's no music on the Sirius NPR channels and I don't think there is any on the XM public radio channel, but on Sirius, the three classical channels have 5 times the audience of the two NPR channels, and on XM, the three classical channels have nearly 17 times the audience of the single public radio channel. Bridge Ratings head Dave Van Dyke has a good blog to which I subscribe via RSS and from which I occasionally quote, but I can't find such a feed for the company's main site. That's too bad, because on those occasions when I remember to check it, I usually find something helpful, such as the subject of this post. Add a feed, please. The future of radio will be an "experience"
Confused about music royalty payments? Traditional Radio to Pay for Play? HD Radio is planning on offering features like enhanced PAD data to show sports scores, stock tickers, and even text-ads. ... And perhaps the most significant announcement was that iBiquity envisions the HD chipset built into MP3 players, PDAs, eTablets, and Smartphones. They expect to make announcements around 2008.